Detail of new addition shown in Figure 4. Photo: © Maxwell MacKenzie. The topic of new additions, including rooftop additions, to historic buildings comes up frequently, especially as it relates to rehabilitation projects. It is often discussed and it is the subject of concern, consternation, considerable disagreement and confusion. Can, in certain instances, a historic building be enlarged for a new use without destroying its historic character? And, just what is significant about each particular historic building that should be preserved? Finally, what kind of new construction is appropriate to the historic building? Figure 1. The addition to the right with its connecting hyphen is compatible with the Collegiate Gothic-style library. The addition is set back from the front of the library and uses the same materials and a simplified design that references, but does not copy, the historic building. Photo: David Wakely Photography. The vast amount of literature on the subject of additions to historic buildings reflects widespread interest as well as divergence of opinion. New additions have been discussed by historians within a social and political framework; by architects and architectural historians in terms of construction technology and style; and by urban planners as successful or unsuccessful contextual design. However, within the historic preservation and rehabilitation programs of the National Park Service, the focus on new additions is to ensure that they preserve the character of historic buildings. Most historic districts or neighborhoods are listed in the National Register of Historic Places for their significance within a particular time frame. This period of significance of historic districts as well as individually-listed properties may sometimes lead to a misunderstanding that inclusion in the National Register may prohibit any physical change outside of a certain historical period—particularly in the form of exterior additions. National Register listing does not mean that a building or district is frozen in time and that no change can be made without compromising the historical significance. It does mean, however, that a new addition to a historic building should preserve its historic character. Figure 2. The new section on the right is appropriately scaled and reflects the design of the historic Art Deco-style hotel. The apparent separation created by the recessed connector also enables the addition to be viewed as an individual building. Figure 3. 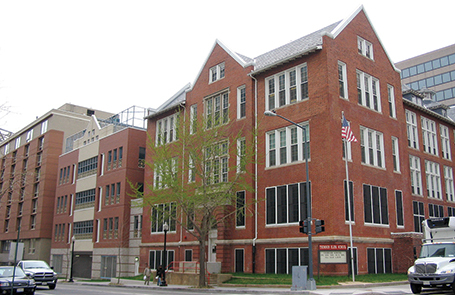 The red and buff-colored parking addition with a rooftop playground is compatible with the early-20th century school as well as with the neighborhood in which it also serves as infill in the urban setting. The subject of new additions is important because a new addition to a historic building has the potential to change its historic character as well as to damage and destroy significant historic materials and features. A new addition also has the potential to confuse the public and to make it difficult or impossible to differentiate the old from the new or to recognize what part of the historic building is genuinely historic. Be differentiated from the historic building. Every historic building is different and each rehabilitation project is unique. Therefore, the guidance offered here is not specific, but general, so that it can be applied to a wide variety of building types and situations. To assist in interpreting this guidance, illustrations of a variety of new additions are provided. Good examples, as well as some that do not meet the Standards, are included to further help explain and clarify what is a compatible new addition that preserves the character of the historic building. Figure 4. 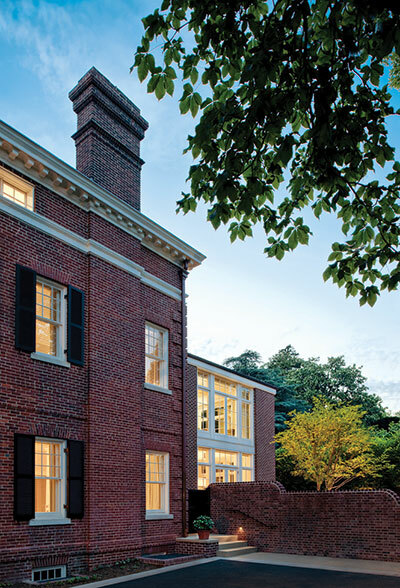 This glass and brick structure is a harmonious addition set back and connected to the rear of the Colonial Revival-style brick house. Cunningham/Quill Architects. Photos: © Maxwell MacKenzie. Attaching a new exterior addition usually involves some degree of material loss to an external wall of a historic building, but it should be minimized. Damaging or destroying significant materials and craftsmanship should be avoided, as much as possible. Generally speaking, preservation of historic buildings inherently implies minimal change to primary or “public” elevations and, of course, interior features as well. Exterior features that distinguish one historic building or a row of buildings and which can be seen from a public right of way, such as a street or sidewalk, are most likely to be the most significant. These can include many different elements, such as: window patterns, window hoods or shutters; porticoes, entrances and doorways; roof shapes, cornices and decorative moldings; or commercial storefronts with their special detailing, signs and glazing patterns. Beyond a single building, entire blocks of urban or residential structures are often closely related architecturally by their materials, detailing, form and alignment. Because significant materials and features should be preserved, not damaged or hidden, the first place to consider placing a new addition is in a location where the least amount of historic material and character-defining features will be lost. In most cases, this will be on a secondary side or rear elevation. One way to reduce overall material loss when constructing a new addition is simply to keep the addition smaller in proportion to the size of the historic building. Limiting the size and number of openings between old and new by utilizing existing doors or enlarging windows also helps to minimize loss. An often successful way to accomplish this is to link the addition to the historic building by means of a hyphen or connector. A connector provides a physical link while visually separating the old and new, and the connecting passageway penetrates and removes only a small portion of the historic wall. A new addition that will abut the historic building along an entire elevation or wrap around a side and rear elevation, will likely integrate the historic and the new interiors, and thus result in a high degree of loss of form and exterior walls, as well as significant alteration of interior spaces and features, and will not meet the Standards. Figure 5. 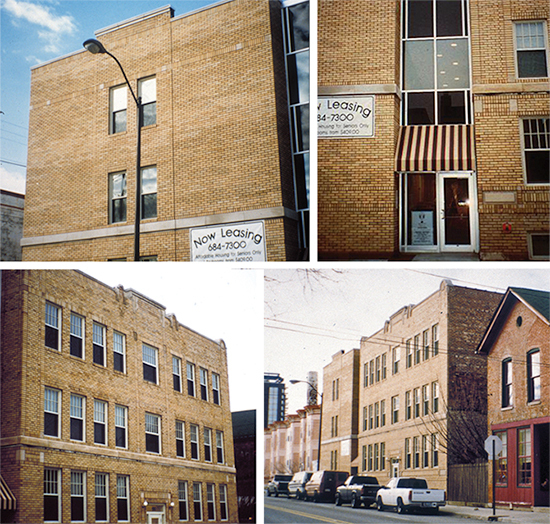 This addition (top left) is constructed of matching brick and attached by a recessed connector (top right) to the 1914 apartment building (bottom left). The design is compatible and the addition is smaller and subordinate to the historic building (bottom right). Figure 6. A new addition (top) is connected to the garage which separates it from the main block of the c. 1910 former florist shop (bottom). The addition is traditional in style, yet sufficiently restrained in design to distinguish it from the historic building. Figure 7. 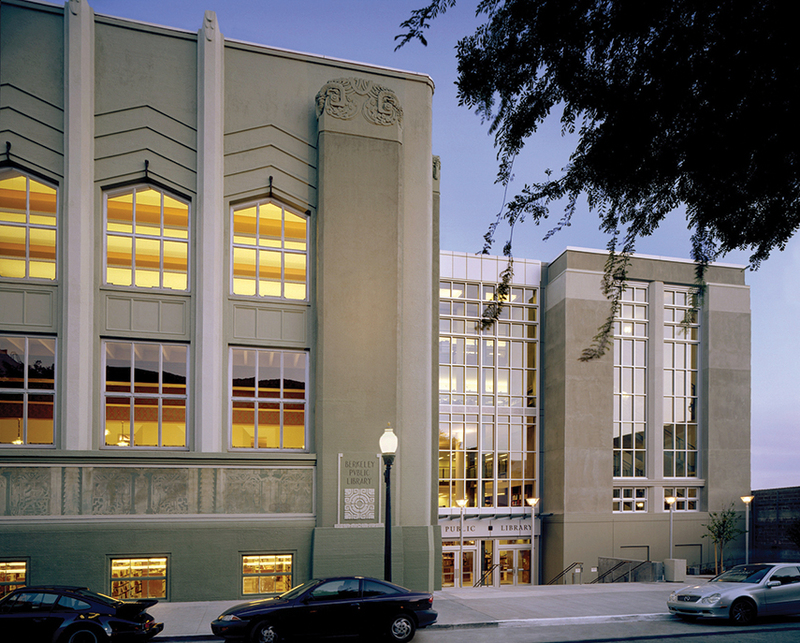 A vacant side lot was the only place a new stair tower could be built when this 1903 theater was rehabilitated as a performing arts center. Constructed with matching materials, the stair tower is set back with a recessed connector and, despite its prominent location, it is clearly subordinate and differentiated from the historic theater. Figure 8. 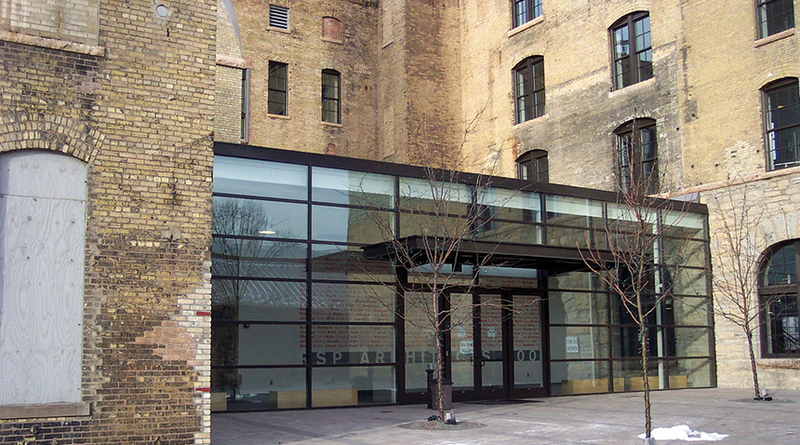 The rehabilitation of this large, early-20th century warehouse (top) into affordable artists’ lofts included the addition of a compatible glass and brick elevator/stair tower at the back (bottom). Figure 9. A simple, brick stair tower replaced two non-historic additions at the rear of this 1879 school building when it was rehabilitated as a women's and children's shelter. The addition is set back and it is not visible from the front of the school. Figure 10. The small size and the use of matching materials ensures that the new addition on the left is compatible with the historic Romanesque Revival-style building. Figure 11. The addition to this early-20th century Gothic Revival-style church provides space for offices, a great hall for gatherings and an accessible entrance (top). The stucco finish, metal roof, narrow gables and the Gothic-arched entrance complement the architecture of the historic church. Placing the addition in back where the ground slopes away ensures that it is subordinate and minimizes its impact on the church (bottom). In accordance with the Standards, a new addition must preserve the building’s historic character and, in order to do that, it must be differentiated, but compatible, with the historic building. A new addition must retain the essential form and integrity of the historic property. Keeping the addition smaller, limiting the removal of historic materials by linking the addition with a hyphen, and locating the new addition at the rear or on an inconspicuous side elevation of a historic building are techniques discussed previously that can help to accomplish this. Rather than differentiating between old and new, it might seem more in keeping with the historic character simply to repeat the historic form, material, features and detailing in a new addition. However, when the new work is highly replicative and indistinguishable from the old in appearance, it may no longer be possible to identify the “real” historic building. Conversely, the treatment of the addition should not be so different that it becomes the primary focus. The difference may be subtle, but it must be clear. A new addition to a historic building should protect those visual qualities that make the building eligible for listing in the National Register of Historic Places. 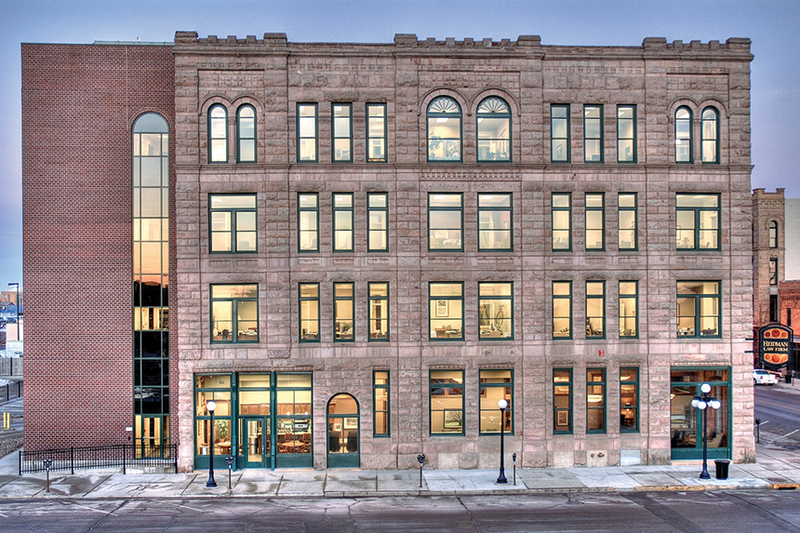 The goal, of course, is a new addition that preserves the building’s historic character. The historic character of each building may be different, but the methodology of establishing it remains the same. Knowing the uses and functions a building has served over time will assist in making what is essentially a physical evaluation. But, while written and pictorial documentation can provide a framework for establishing the building's history, to a large extent the historic character is embodied in the physical aspects of the historic building itself—shape, materials, features, craftsmanship, window arrangements, colors, setting and interiors. Thus, it is important to identify the historic character before making decisions about the extent—or limitations—of change that can be made. A new addition should always be subordinate to the historic building; it should not compete in size, scale or design with the historic building. An addition that bears no relationship to the proportions and massing of the historic building—in other words, one that overpowers the historic form and changes the scale—will usually compromise the historic character as well. The appropriate size for a new addition varies from building to building; it could never be stated in a square or cubic footage ratio, but the historic building's existing proportions, site and setting can help set some general parameters for enlargement. Although even a small addition that is poorly designed can have an adverse impact, to some extent, there is a predictable relationship between the size of the historic resource and what is an appropriate size for a compatible new addition. Generally, constructing the new addition on a secondary side or rear elevation—in addition to material preservation—will also preserve the historic character. Not only will the addition be less visible, but because a secondary elevation is usually simpler and less distinctive, the addition will have less of a physical and visual impact on the historic building. Such placement will help to preserve the building's historic form and relationship to its site and setting. Historic landscape features, including distinctive grade variations, also need to be respected. Any new landscape features, including plants and trees, should be kept at a scale and density that will not interfere with understanding of the historic resource itself. A traditionally landscaped property should not be covered with large paved areas for parking which would drastically change the character of the site. Despite the fact that in most cases it is recommended that the new addition be attached to a secondary elevation, sometimes this is not possible. There simply may not be a secondary elevation—some important freestanding buildings have significant materials and features on all sides. A structure or group of structures together with its setting (for example, a college campus) may be of such significance that any new addition would not only damage materials, but alter the buildings' relationship to each other and the setting. 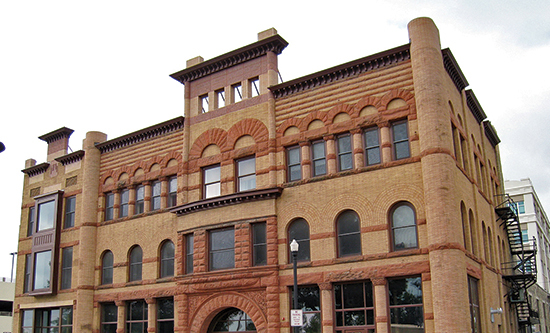 An addition attached to a highly-visible elevation of a historic building can radically alter the historic form or obscure features such as a decorative cornice or window ornamentation. Similarly, an addition that fills in a planned void on a highly-visible elevation (such as a U-shaped plan or a feature such as a porch) will also alter the historic form and, as a result, change the historic character. Under these circumstances, an addition would have too much of a negative impact on the historic building and it would not meet the Standards. Such situations may best be handled by constructing a separate building in a location where it will not adversely affect the historic structure and its setting. In other instances, particularly in urban areas, there may be no other place but adjacent to the primary façade to locate an addition needed for the new use. It may be possible to design a lateral addition attached on the side that is compatible with the historic building, even though it is a highly-visible new element. Certain types of historic structures, such as government buildings, metropolitan museums, churches or libraries, may be so massive in size that a relatively large-scale addition may not compromise the historic character, provided, of course, the addition is smaller than the historic building. Occasionally, the visible size of an addition can be reduced by placing some of the spaces or support systems in a part of the structure that is underground. Large new additions may sometimes be successful if they read as a separate volume, rather than as an extension of the historic structure, although the scale, massing and proportions of the addition still need to be compatible with the historic building. However, similar expansion of smaller buildings would be dramatically out of scale. In summary, where any new addition is proposed, correctly assessing the relationship between actual size and relative scale will be a key to preserving the character of the historic building. Figure 12. 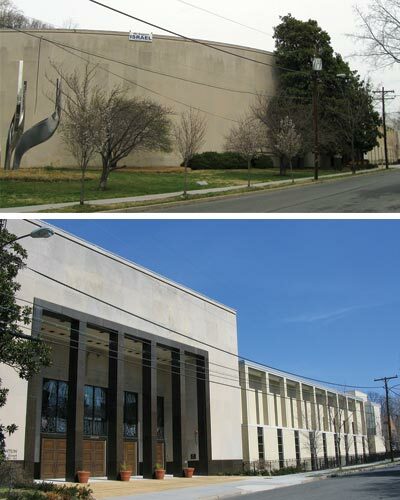 This 1954 synagogue (top) is accessed through a monumental entrance to the right. The new education wing (bottom) added to it features the same vertical elements and color and, even though it is quite large, its smaller scale and height ensure that it is secondary to the historic resource. There is no formula or prescription for designing a new addition that meets the Standards. A new addition to a historic building that meets the Standards can be any architectural style—traditional, contemporary or a simplified version of the historic building. However, there must be a balance between differentiation and compatibility in order to maintain the historic character and the identity of the building being enlarged. New additions that too closely resemble the historic building or are in extreme contrast to it fall short of this balance. Inherent in all of the guidance is the concept that an addition needs to be subordinate to the historic building. A new addition must preserve significant historic materials, features and form, and it must be compatible but differentiated from the historic building. To achieve this, it is necessary to carefully consider the placement or location of the new addition, and its size, scale and massing when planning a new addition. To preserve a property’s historic character, a new addition must be visually distinguishable from the historic building. This does not mean that the addition and the historic building should be glaringly different in terms of design, materials and other visual qualities. 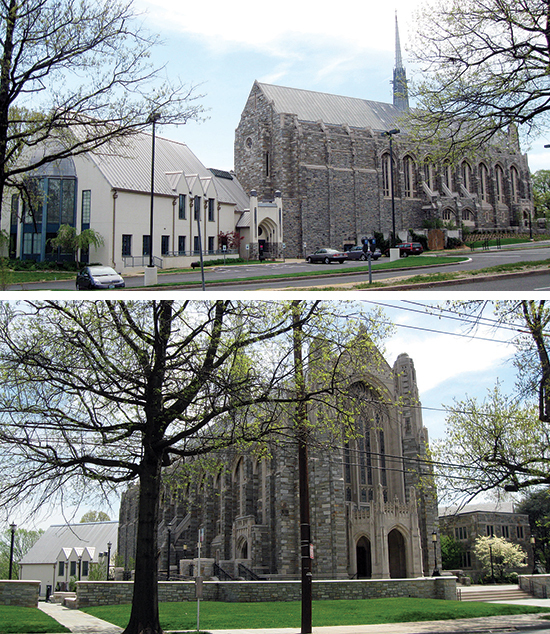 Instead, the new addition should take its design cues from, but not copy, the historic building. Incorporate a simple, recessed, small-scale hyphen to physically separate the old and the new volumes or set the addition back from the wall plane(s) of the historic building. Avoid designs that unify the two volumes into a single architectural whole. The new addition may include simplified architectural features that reflect, but do not duplicate, similar features on the historic building. This approach will not impair the existing building’s historic character as long as the new structure is subordinate in size and clearly differentiated and distinguishable so that the identity of the historic structure is not lost in a new and larger composition. The historic building must be clearly identifiable and its physical integrity must not be compromised by the new addition. Base the size, rhythm and alignment of the new addition’s window and door openings on those of the historic building. Respect the architectural expression of the historic building type. For example, an addition to an institutional building should maintain the architectural character associated with this building type rather than using details and elements typical of residential or other building types. 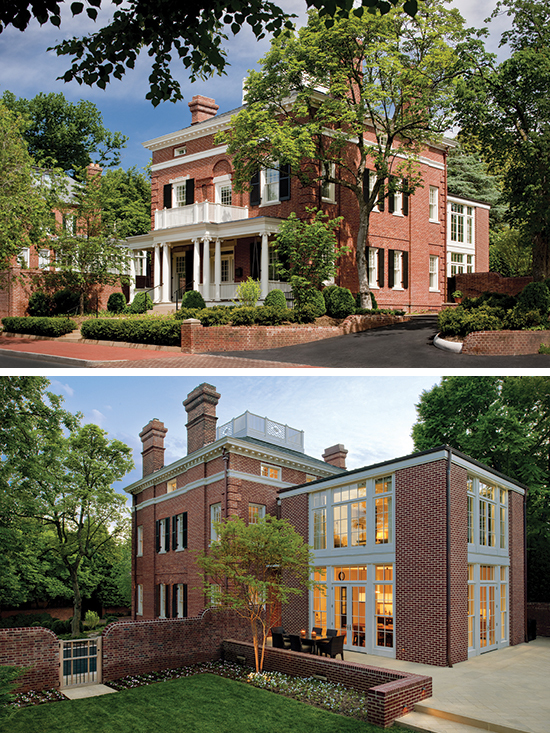 These techniques are merely examples of ways to differentiate a new addition from the historic building while ensuring that the addition is compatible with it. Other ways of differentiating a new addition from the historic building may be used as long as they maintain the primacy of the historic building. Working within these basic principles still allows for a broad range of architectural expression that can range from stylistic similarity to contemporary distinction. The recommended design approach for an addition is one that neither copies the historic building exactly nor stands in stark contrast to it. Figure 13. 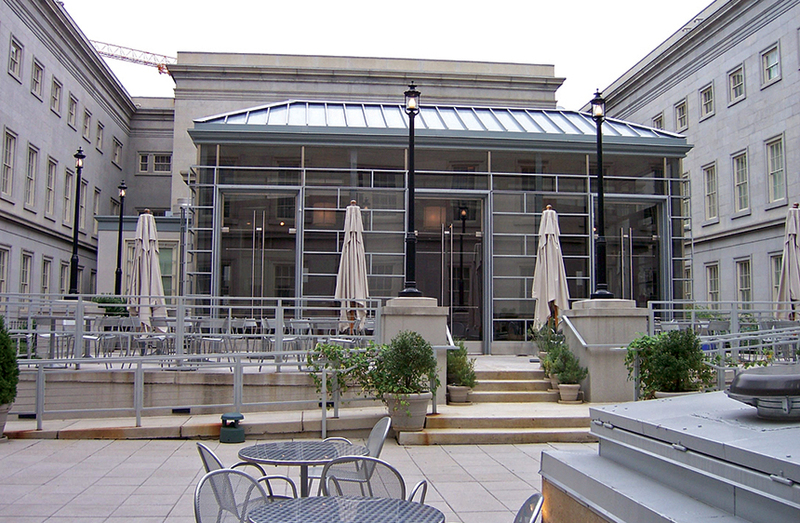 A glass and metal structure was constructed in the courtyard as a restaurant when this 1839 building was converted to a hotel. Although such an addition might not be appropriate in a more public location, it is compatible here in the courtyard of this historic building. Figure 14. This glass addition was erected at the back of an 1895 former brewery during rehabilitation to provide another entrance. The addition is compatible with the plain character of this secondary elevation. Figure 15 (above). 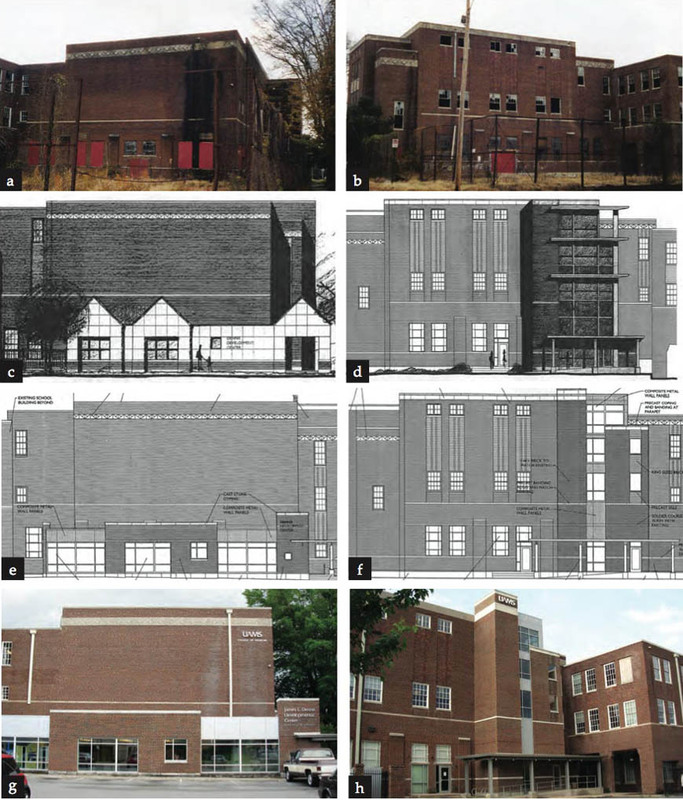 The rehabilitation of a c. 1930 high school auditorium for a clinic and offices proposed two additions: a one-story entrance and reception area on this elevation (a); and a four-story elevator and stair tower on another side (b). The gabled entrance (c) first proposed was not compatible with the flat-roofed auditorium and the design of the proposed stair tower (d) was also incompatible and overwhelmed the historic building. The designs were revised (e-f) resulting in new additions that meet the Standards (g-h). Figure 16. The proposal to add three row houses to the rear ell of this early-19th century residential property doubles its size and does not meet the Standards. Figure 17. The small addition on the left is starkly different and it is not compatible with the eclectic, late-19th century house. Figure 18. The expansion of a one- and one-half story historic bungalow (left) with a large two-story rear addition (right) has greatly altered and obscured its distinctive shape and form. Figure 19. 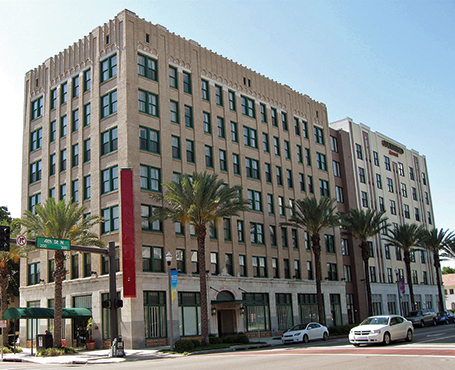 The upper two floors of this early-20th century office building were part of the original design, but were not built. During rehabilitation, the two stories were finally constructed. This treatment does not meet the Standards because the addition has given the building an appearance it never had historically. Figure 20. 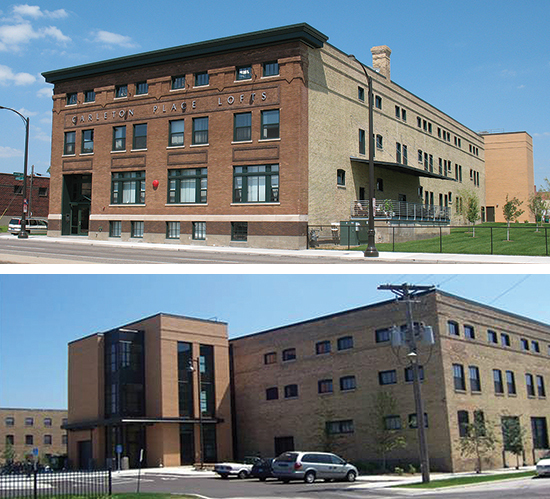 The height, as well as the design, of these two-story rooftop additions overwhelms the two-story and the one-story, low-rise historic buildings. In built-up urban areas, locating a new addition on a less visible side or rear elevation may not be possible simply because there is no available space. In this instance, there may be alternative ways to help preserve the historic character. One approach when connecting a new addition to a historic building on a primary elevation is to use a hyphen to separate them. A subtle variation in material, detailing and color may also provide the degree of differentiation necessary to avoid changing the essential proportions and character of the historic building. A densely-built neighborhood such as a downtown commercial core offers a particular opportunity to design an addition that will have a minimal impact on the historic building. Often the site for such an addition is a vacant lot where another building formerly stood. Treating the addition as a separate or infill building may be the best approach when designing an addition that will have the least impact on the historic building and the district. In these instances there may be no need for a direct visual link to the historic building. Height and setback from the street should generally be consistent with those of the historic building and other surrounding buildings in the district. 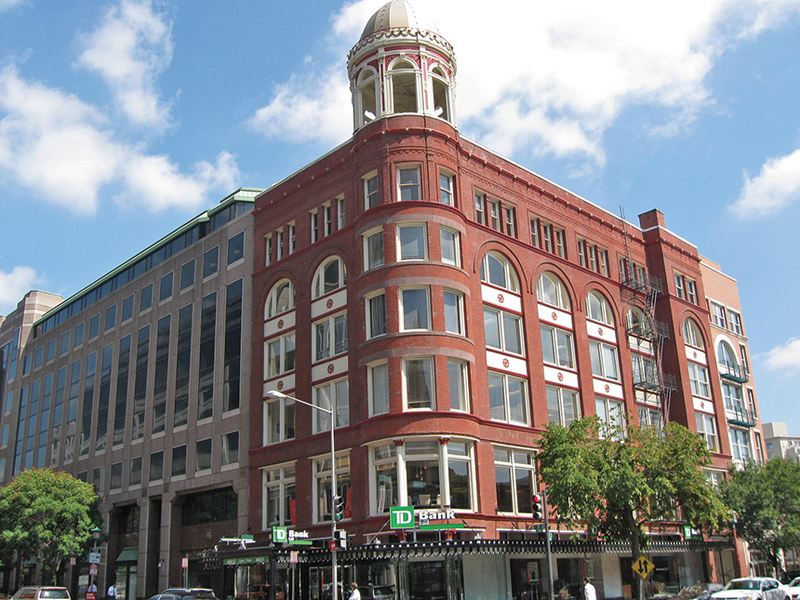 Thus, in most urban commercial areas the addition should not be set back from the façade of the historic building. A tight urban setting may sometimes even accommodate a larger addition if the primary elevation is designed to give the appearance of being several buildings by breaking up the facade into elements that are consistent with the scale of the historic building and adjacent buildings. Figure 21. Both wings of this historic L-shaped building (above, left), which fronts on two city streets, adjoined vacant lots. 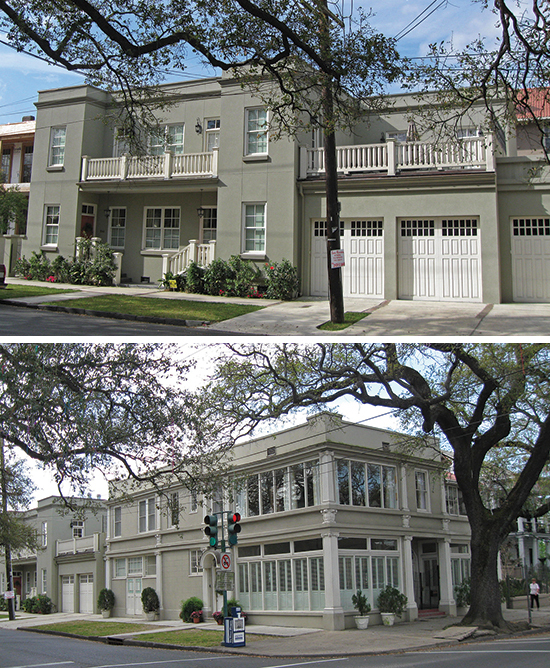 A two-story addition was constructed on one lot (above, middle) and a six-story addition was built on the other (above, right). Like the historic building, which has two different facades, the compatible new additions are also different and appear to be separate structures rather than part of the historic building. Figure 22. The proposed new addition is compatible with the historic buildings that remain on the block. Its design with multiple storefronts helps break up the mass. The guidance provided on designing a compatible new addition to a historic building applies equally to new rooftop additions. A rooftop addition should preserve the character of a historic building by preserving historic materials, features and form; and it should be compatible but differentiated from the historic building. However, there are several other design principles that apply specifically to rooftop additions. Generally, a rooftop addition should not be more than one story in height to minimize its visibility and its impact on the proportion and profile of the historic building. A rooftop addition should almost always be set back at least one full bay from the primary elevation of the building, as well as from the other elevations if the building is free-standing or highly visible. It is difficult, if not impossible, to minimize the impact of adding an entire new floor to relatively low buildings, such as small-scale residential or commercial structures, even if the new addition is set back from the plane of the façade. Constructing another floor on top of a small, one, two or three-story building is seldom appropriate for buildings of this size as it would measurably alter the building’s proportions and profile, and negatively impact its historic character. 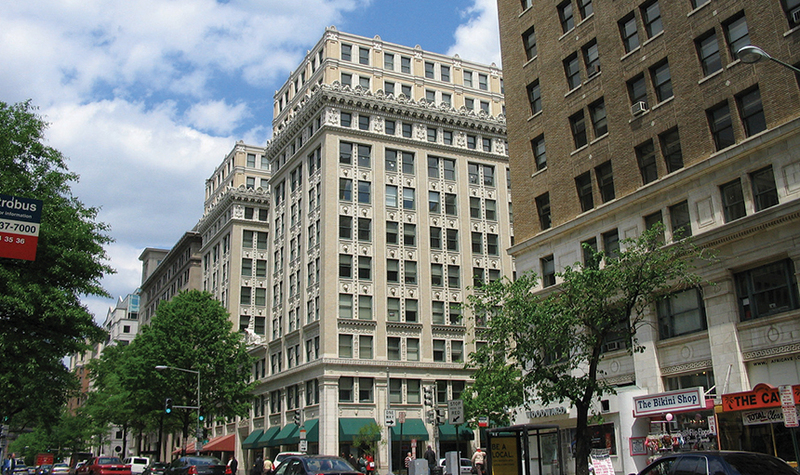 On the other hand, a rooftop addition on an eight-story building, for example, in a historic district consisting primarily of tall buildings might not affect the historic character because the new construction may blend in with the surrounding buildings and be only minimally visible within the district. A rooftop addition in a densely-built urban area is more likely to be compatible on a building that is adjacent to similarly-sized or taller buildings. A number of methods may be used to help evaluate the effect of a proposed rooftop addition on a historic building and district, including pedestrian sight lines, three-dimensional schematics and computer-generated design. However, drawings generally do not provide a true “picture” of the appearance and visibility of a proposed rooftop addition. For this reason, it is often necessary to construct a rough, temporary, full-size or skeletal mock up of a portion of the proposed addition, which can then be photographed and evaluated from critical vantage points on surrounding streets. Figure 23. Colored flags marking the location of a proposed penthouse addition (a) were placed on the roof to help evaluate the impact and visibility of an addition planned for this historic furniture store (b). Based on this evaluation, the addition was constructed as proposed. It is minimally visible and compatible with the 1912 structure (c). The tall parapet wall conceals the addition from the street below (d). Figure 24. How to Evaluate a Proposed Rooftop Addition. (A) A sight-line study only factors in views from directly across the street, which can be very restrictive and does not illustrate the full effect of an addition from other public rights of way. (B) A mock up is essential to evaluate the impact of a proposed rooftop addition on the historic building. (C) A mock up can be enhanced by a computer-generated rendering to evaluate the impact of a proposed rooftop addition on the historic building. Figure 25. 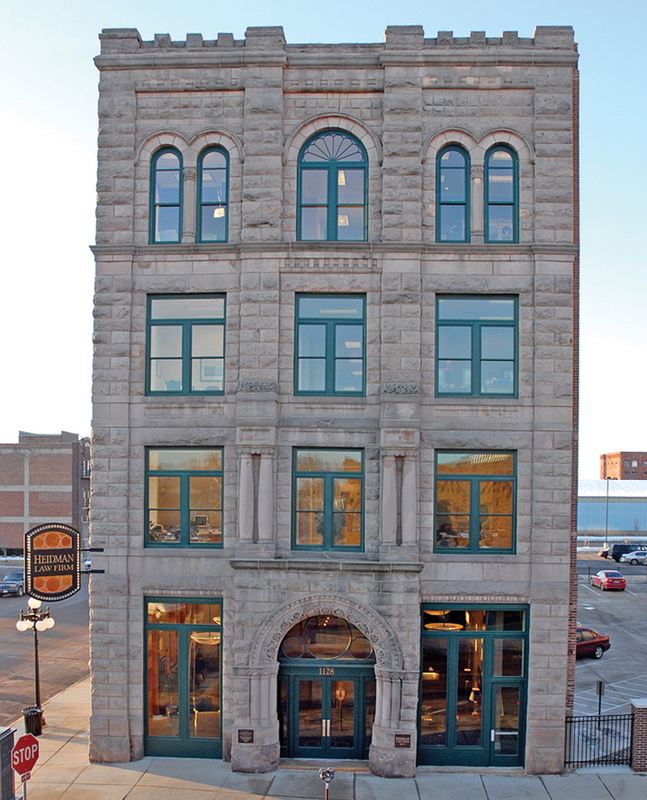 It was possible to add a compatible, three-story, penthouse addition to the roof of this five-story, historic bank building because the addition is set far back, it is surrounded by taller buildings and a deep parapet conceals almost all of the addition from below. Figure 26. (A) A rooftop addition would have negatively impacted the character of the primary facade of this mid-19th century, four-story structure and the low-rise historic district. (B) A third floor was successfully added on the two-story rear portion of the same building with little impact to the building or the district because it blends in with the height of the adjacent building. A new addition should be simple and unobtrusive in design, and should be distinguished from the historic building—a recessed connector can help to differentiate the new from the old. A new addition should not be highly visible from the public right of way; a rear or other secondary elevation is usually the best location for a new addition. The construction materials and the color of the new addition should be harmonious with the historic building materials. The new addition should be smaller than the historic building—it should be subordinate in both size and design to the historic building. A rooftop addition is generally not appropriate for a one, two or three-story building—and often is not appropriate for taller buildings. A rooftop addition should be minimally visible. Generally, a rooftop addition must be set back at least one full bay from the primary elevation of the building, as well as from the other elevations if the building is freestanding or highly visible. Generally, a rooftop addition should not be more than one story in height. Generally, a rooftop addition is more likely to be compatible on a building that is adjacent to similarly-sized or taller buildings. Figure 27a. The compatible addition is set back and does not compete with the historic building. Photo: Chadd Gossmann, Aurora Photography, LLC. Figure 27b. Although the new brick stair/elevator tower (27a) is not visible from the front (27b), it is on a prominent side elevation of this 1890 stone bank. The compatible addition is set back and does not compete with the historic building. Photos: Chadd Gossmann, Aurora Photography, LLC. Figure 28. A small addition (left) was constructed when this 1880s train station was converted for office use. The paired doors with transoms and arched windows on the compatible addition reflect, but do not replicate, the historic building (right). Figure 29. This simple glass and brick entrance (left) added to a secondary elevation of a 1920sschool building (right) is compatible with the original structure. 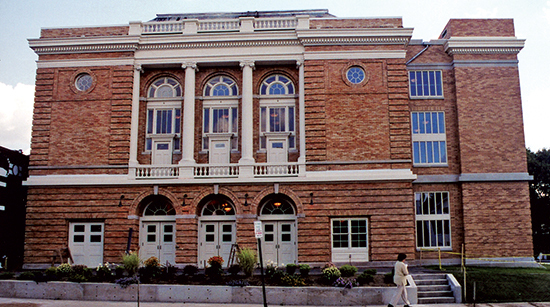 Because a new exterior addition to a historic building can damage or destroy significant materials and can change the building's character, an addition should be considered only after it has been determined that the new use cannot be met by altering non-significant, or secondary, interior spaces. If the new use cannot be met in this way, then an attached addition may be an acceptable alternative if carefully planned and designed. A new addition to a historic building should be constructed in a manner that preserves significant materials, features and form, and preserves the building’s historic character. Finally, an addition should be differentiated from the historic building so that the new work is compatible with—and does not detract from—the historic building, and cannot itself be confused as historic. Figure 30. The small addition on the right of this late-19th century commercial structure is clearly secondary and compatible in size, materials and design with the historic building. Figure 31. 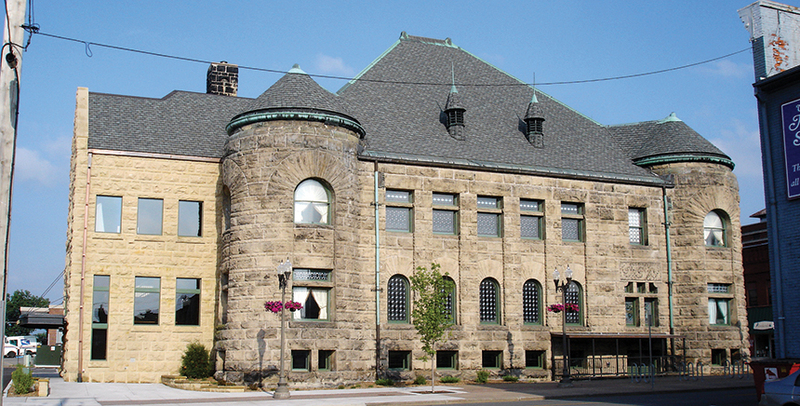 An elevator/stair tower was added at the back of this Richardsonian Romanesque-style theater when it was rehabilitated. Rough-cut stone and simple cut-out openings ensure that the addition is compatible and subordinate to the historic building. Photo: Chuck Liddy, AIA. Anne E. Grimmer, Senior Architectural Historian, Technical Preservation Services Branch, National Park Service, revised Preservation Brief 14, written by Kay D. Weeks and first published in 1986. The revised Brief features all new illustrations and contains expanded and updated design guidance on the subject of new additions that has been developed by the Technical Preservation Services Branch since the original publication of the Brief. 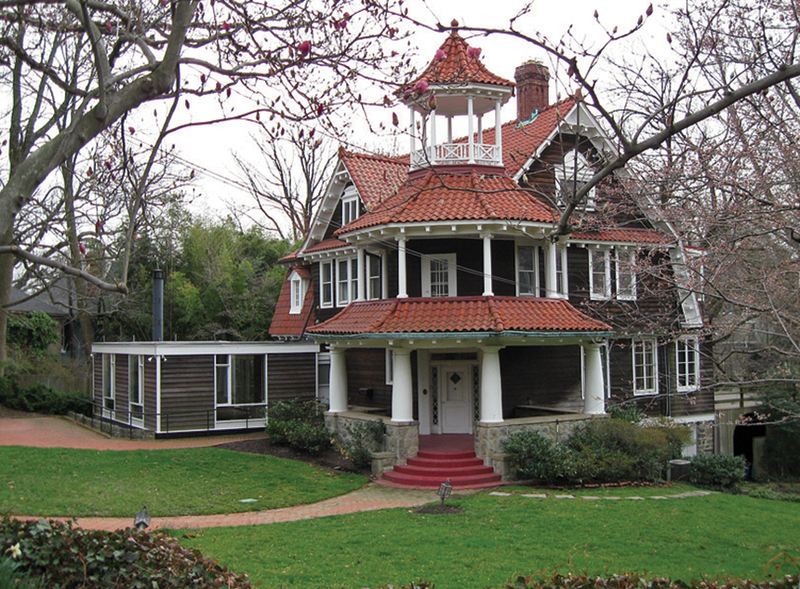 Several individuals generously contributed their time and expertise to review the revision of this Preservation Brief, including: Sharon C. Park, FAIA, Chief, Architectural History and Historic Preservation, Smithsonian Institution; Elizabeth Tune and Karen Brandt, Department of Historic Resources, Commonwealth of Virginia; and Phillip Wisley and David Ferro, Division of Historical Resources, Florida Department of State. The Technical Preservation Services professional staff, in particular Michael J. Auer, Jo Ellen Hensley, Gary Sachau and Rebecca Shiffer, also provided important guidance in the development of this publication. All illustrations are from National Park Service files unless otherwise credited. This publication has been prepared pursuant to the National Historic Preservation Act of 1966, as amended, which directs the Secretary of the Interior to develop and make available information concerning historic properties. The Technical Preservation Services Branch, National Park Service, prepares standards, guidelines and other educational materials on responsible historic preservation treatments for a broad public audience. Comments about this publication should be addressed to: Charles E. Fisher, Technical Preservation Publications Program Manager, Technical Preservation Services-2255, National Park Service, 1849 C Street, NW, Washington, DC 20240. This publication is not copyrighted and can be reproduced without penalty. Normal procedures for credit to the author and the National Park Service are appreciated. Byard, Paul Spencer. The Architecture of New Additions: Design and Regulation. New York, NY: W.W. Norton & Company, 1998. Day, Steven, AIA. “Modernism Meets History: New Additions to Historic Structures.” Preservation Seattle [Historic Seattle’s online monthly preservation magazine.] May 2003. www.historicseattle.org/preservationseattle/publicpolicy/defaultmay2.htm. Incentives! A Guide to the Federal Historic Preservation Tax Incentives Program for Income-Producing Properties. “Avoiding Incompatible Treatments: New Additions & Rooftop Additions.” Technical Preservation Services Branch, National Park Service. Online at www.nps.gov/tps/. Interpreting the Standards Bulletins (ITS). Technical Preservation Services Branch, National Park Service. Online at www.nps.gov/tps/. New Additions to Historic Buildings. Technical Preservation Services Branch, National Park Service. Online at www.nps.gov/tps/. O’Connell, Kim A. “Making Connections.” Traditional Building. March/April 2004. (Vol. 17, No. 2), pp. 12-15. The Secretary of the Interior's Standards for Rehabilitation and Guidelines for Rehabilitating Historic Buildings. Washington, D.C.: U.S. Department of the Interior, National Park Service, Preservation Assistance Division, rev. 1990. The Secretary of the Interior's Standards for Rehabilitation & Illustrated Guidelines for Rehabilitating Historic Buildings. (Authors: W. Brown Morton, III, Gary L. Hume, Kay D. Weeks, and H. Ward Jandl. Project Directors: Anne E. Grimmer and Kay D. Weeks.) Washington, D.C.: U.S. Department of the Interior, National Park Service, Preservation Assistance Division, 1992. Online at www.nps.gov/tps/. Semes, Steven W. “Differentiated and Compatible: The Secretary’s Standards revisited.” Traditional Building. February 2009. (Vol. 22, No. 1), pp. 20-23. Semes, Steven W. The Future of the Past: A Conservation Ethic for Architecture, Urbanism, and Historic Preservation. (In association with The Institute of Classical Architecture and Classical America.) New York, NY: W.W. Norton & Company, 2009.